A long time ago…in 2017…I wrote a piece detailing why “The Imperial March” is my absolute favorite musical score in the Star Wars franchise. This admission came as little surprise to many of my trove of followers/readers as I have often professed my cultish admiration for The Empire Strikes Back (ESB) on this site. It stood to reason that The Imperial March would top my list considering the fact that the iconic anthem for the Galactic Empire/Darth Vader was first introduced in Episode V. Plus, given my “Casterfoian” obsession with the Empire, it stood to reason that I would likewise adopt the score as my all-time favorite. While my unadulterated affection for all things ESB stands firm, and “The Imperial March” continues to receive constant replays on my Spotify account, there are never-the-less many other pieces of Star Wars music that have been elevated to the top of my musical mind. Hardly a shock – I am positive you can say the same if you happen to be a Star Wars fan – I wanted to take the opportunity to share a musical composition from each Star Wars film that I hold near and dear to my heart. For the sake of brevity, I have only chosen one from each film and decided to forgo long-winded explanations detailing why I love each piece, in large part because music is so damn personal it would take some of the fun out of it. Still, I may do a post for each at some point if the Force moves me to do so. We shall see. Enjoy and be sure to comment with your own “faves” list! While my heart will always be dedicated to “The Imperial March,” I decided to share another score from ESB in this particular list to mix things up a bit. **Surprise! You were expecting “Duel of the Fates” weren’t you? Here is the deal: I love “Duel of the Fates” with a crazy passion but I likewise love “The Droid Invasion and the Appearance of Darth Maul.” I had to pick one and so I went with my gut. Besides, just listen to how the piece shifts when Maul is introduced! Holy frick that is haunting!!!! The word “theme” is appropriate here because, let’s face it, I consistently return to The Empire Strikes Back to discuss my favorite aspects of Star Wars. It should really come as no surprise, then, that my favorite score would also come from my favorite Star Wars film. Naturally I love Star Wars across the board, but my deep affection for The Empire Strikes Back – embedded within me as a child – is the true grounding of my Star Wars adoration. That being the case, the issue at hand is not that my favorite musical score comes from The Empire Strikes Back, but rather, why is this particular score from the film’s soundtrack my favorite and not another? To be entirely blunt, “The Imperial March (Darth Vader’s Theme)” is my favorite score because it is established as the de facto anthem of the Galactic Empire. As a child, I was fascinated by the Empire, having a “Casterfoian” (google “Casterfo”) interest in the baddies of the Star Wars universe. While I knew the Empire was evil, and I celebrated the destruction of the Death Star in A New Hope with the Rebels, The Empire Strikes Back introduced me to a different way of viewing/experiencing the Empire. No longer were they simply the bad guys with a massive moon-sized space station but, instead, they were the bad guys who had Probe Droids, Super Star Destroyers, Imperial Walkers, Snowtroopers, TIE Bombers, and more. Even though they took a big hit in A New Hope, these baddies were anything but knocked out, and still had the means to level a crushing blow to the Rebel Alliance on the planet Hoth. And, to top it off, the Empire now had distinct piece of music – doubling as the theme for the villainous Darth Vader – to capture their harsh, galactic reach. To this day, the raw power of “The Imperial March” continues to captivate and hold me not only because it originates in The Empire Strikes Back, but because I have come to appreciate it on a deeper level. As a child, I was unaware that the piece was influenced by Chopin’s “Funeral March” and Gustav Holst’s “Mars, the Bringer of War.” And yet, today, I am equally captivated by these pieces, all thanks to my childhood enjoyment of the Empire/Vader’s powerful anthem. Plus, this is also the case with a number of others scores from Star Wars, my enjoyment of these leading me to a more profound appreciation of other classical pieces. …which is, in a very real sense, the point of the piece. “The Imperial March” is aptly named because it perfectly encompasses the forward progress of the Galactic Empire, a progression which is difficult to stop. The Empire, wounded as it was at Yavin IV, continues its march of terror, death, and destruction. And, of course, Darth Vader spearheads the Imperial march across the galaxy, hunting down those who wish to stop the Empire. But it cannot be stopped, it will not be stopped, and it is futile to even try. This post is part of the Star Wars ComLINKS series. Check out more Star Wars ComLINKS over at Anakin and His Angel. It was only recently that I discovered Wildwood Kin, an alt-folk trio from Exeter, England. Listening to a Spotify-suggested playlist, I suddenly found myself surprised and mesmerized by the three-part harmonies of the women and their beautifully blended instruments in the song “Warrior Daughter.” As the music washed over me like a wave, the lyrics to “Warrior Daughter” took root in my mind, intertwining as they did with Jyn Erso, the hero in the Star Wars film Rogue One. Art moves and affects us all in different ways, and in the case of “Warrior Daughter” the raw power and symbolism in the song about a daughter who has “been made warrior” led me back to Jyn Erso, to her relationship with her parents Lyra and Galen, and her selfless actions to steal the Death Star plans. While I dare not set out to interpret every way I view Jyn Erso as the “Warrior Daughter” described in the song, wishing instead to allow you to create connections for yourself if you so choose, I am never-the-less motivated to share one association that captured me. In short, I could not help but imagine the song’s narrator being one, or even both, of Jyn’s parents describing the “strength and courage” that “lies within your [her] heart.” To this we can add the lyrics “you have been made warrior/for your heart belongs to me” which, to me, reinforce the notion that as Jyn grew up – after she had physically lost her parents as a child – they were never-the-less always a part of who she was, her heart belonging to the parents she loved. On this point, I am reminded of Jyn’s declaration to Director Krennic on the Scarif Tower late in Rogue One. When Krennic emphatically inquires “Who are you?” our hero declares (with strength and courage) that “I am Jyn Erso, daughter of Galen and Lyra.” I am Jyn Erso; I am the warrior daughter of Galen and Lyra. Krennic might have been responsible for the pain of physically removing her parents from her life, but he never removed them from who she was, for her heart always belonged to them, and they have always resided within her. Listen to “Warrior Daughter,” check out the lyrics, and leave a comment either here (or on Twitter @ImperialTalker) with your thoughts on the song I chose for Jyn Erso and also to share songs you would choose for her. Tunesday is a new series on The Imperial Talker where I present a song that I believe reflects a Star Wars character in some way, shape, or form. New Tunesday posts will arrive on Tuesdays with complete infrequency. And never fear for I have also provided links to each piece so you needn’t head off to YouTube or Spotify. Just click the title of each section below, each of which is aptly named for the song being discussed. ‘Parade of the Ewoks’ is not just one of the more unique pieces of music in the entire Star Wars soundtrack, but I would also rank it as one of the most iconic pieces. Yeah, you heard me, I would put it up there with ‘The Imperial March,’ ‘Duel of the Fates,’ ‘Across the Stars,’ ‘The Hologram/Binary Sunset,’ and ‘The Throne Room.’ And no, this is NOT my entire list of iconic Star Wars music, I am just giving examples. While I love the way ‘Parade of the Ewoks’ sounds, what I truly appreciate about this short piece is that it captures the essence of the Ewoks and translates this into a sort of musical story about them. In the Return of the Jedi, the very first Ewok we meet is Wicket. Probably the most popular of all the Ewoks, Wicket initially gives off the impression that these primitive creatures are curious, simple and even somewhat ridiculous. However, as the movie progresses, the Ewoks turn out to be much more capable and interesting than perhaps we originally anticipated. Think about it – this first Ewok we meet is holding a rudimentary spear and is frightened when Leia takes off her helmet. But later in the film, we see one Ewok pilot a speeder bike, two will drive an AT-ST along with Chewbacca, and another is seen raising a captured Stormtrooper blaster. Flitchee holds up a Stormtrooper blaster in triumph. Primitive they might be, but don’t confuse this with being simple-minded or incompetent. The Ewoks are far more intelligent and dynamic than meets the eye. 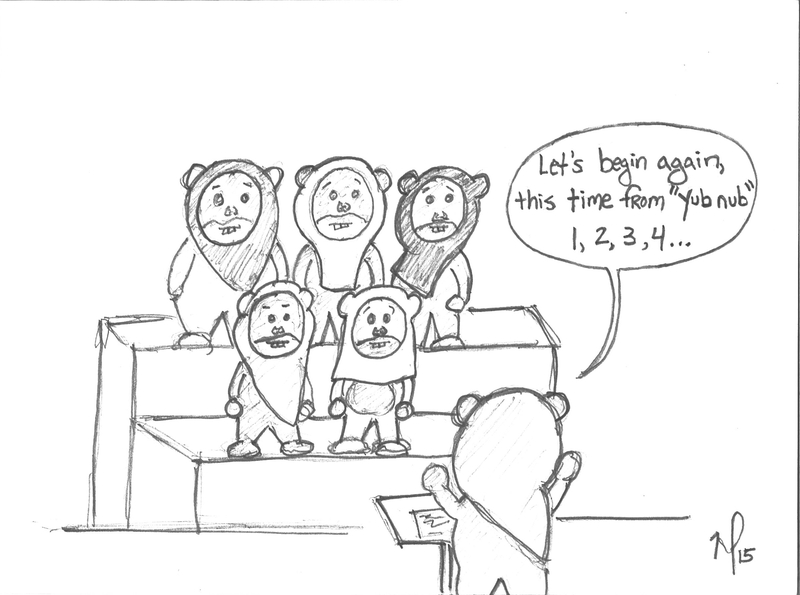 So, as you listen to ‘Parade of the Ewoks,’ pay attention to the melody that repeats over and over again. This melody, which all would agree is the theme music for the Ewoks, will not repeat in exactly the same way, though. Rather, while it begins in a modest and unassuming manner, when it does repeat it will do so in a new way each time. The essence of the melody, the essence of the Ewoks, will remain the same, but the melody will also evolve, becoming more robust, more dynamic, just as the Ewoks do in the film. And what we are left with, then, is a melodious biography that beautifully describes these fascinating creatures, one that consistently stays true to their humble and curious nature while also illuminating them as exciting and vibrant creatures. The score that originally played during the final scene in Return of the Jedi, ‘Ewok Celebration,’ was, and for many older Star Wars fans still is, the music that highlighted the victory of the Rebellion over the Empire. Of course, I use the words “originally” and “was” for obvious reasons. When the original films were remastered and re-released as Special Editions in the late 90s, ‘Ewok Celebration’ was replaced by a different piece titled ‘Victory Celebration.’ Being in a theater watching the Special Edition of Return of the Jedi was an overwhelming and powerful experience, but I also remember feeling surprised by the change. However, this isn’t to say that I dislike ‘Victory Celebration.’ Oh no, I do like it and think it works well with the added scenes George Lucas installed in the final frames. But while I genuinely enjoy ‘Victory Celebration,’ I have always felt a little sad that ‘Ewok Celebration’ was pulled from the film. You see, the thing about ‘Ewok Celebration’ is that it is not just music, it is a song. And, it is not just any type of song, but one sung in Ewokese, the language of the Ewoks. 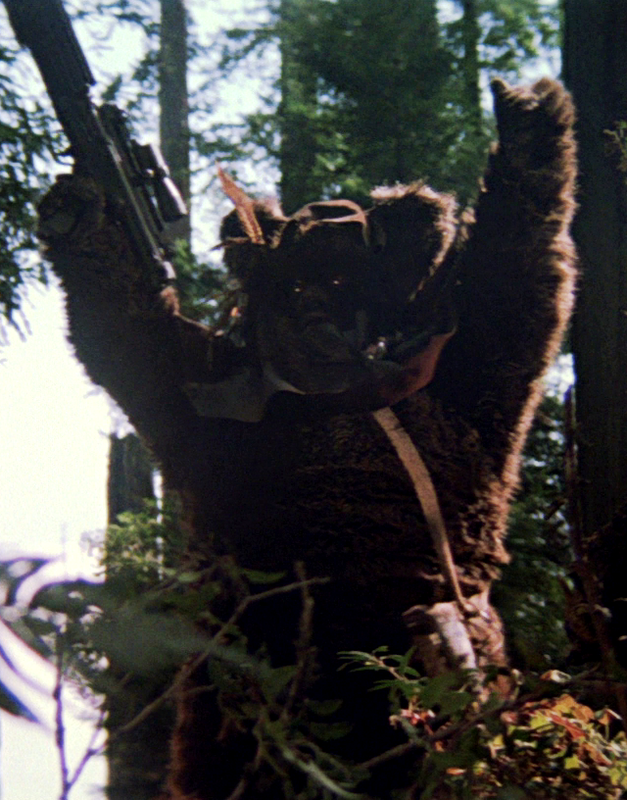 In fact, it is commonly called ‘Yub Nub’ (Freedom), called this because it is the first Ewok word in the song. Really, my feeling of sadness is because ‘Ewok Celebration’ was always PART of the story. While the vast majority of music in Star Wars is non-diegetic, playing in the background, ‘Yub Nub’ always gave off the vibe of being diegetic, actually being sung by the Ewoks. I am aware that the people singing actually sound more like a choir and less a tribe of primitive beings, but who cares! ‘Ewok Celebration’ was an internal piece of Star Wars and, when it got pulled, I have just always had the feeling that Return of the Jedi lost a little piece of itself. Of course, my feelings about ‘Ewok Celebration’ are also due to the surreal recognition that many of the little kids out there who are growing up loving Star Wars have probably never even heard ‘Ewok Celebration.’ I am sure some have, but chances are most haven’t. Well, someday when I have kids, I will be happy to watch any version of Star Wars with them, but I will also be sure to show them the ORIGINAL versions of the original films, and will have them experience ‘Ewok Celebration’ in all of its Yub Nubby glory! My kids deserve it, and so do the Ewoks.